Hill-Rom announced March 12, 2019 that it was in the process of acquiring Voalte for $180 million. An additional $15 million earn out was also disclosed. With annual revenue approaching $40M, the enterprise-value to revenue multiple for Voalte is a over 4.5. The acquisition is expected to close during Hill-Rom's third quarter of 2019, which ends June 30th 2019. Voalte was rumored to be for sale since Q4 of 2018. Founded by Trey Lauderdale in 2008, Voalte is located in Sarasota, Florida and currently has about 140 employees. Voalte sells perpetual software licenses, services and resells smartphones and other hardware. The name Voalte an acronym of sorts: the Vo is for “voice”, the al refers to “alarms” and the te stands for “text messaging." Voalte raised almost $70 million in equity and debt. Ascension Ventures, Bedford Capital and Cerner are past investors. According to Apptopia, Voalte has 22,140 mobile app downloads per month. The company has 7 patents and 5 registered trademarks. Voalte is a very strong nursing communications tool for the acute care environment known for passionate users and champions. They have been known for their easy to learn and use user interface, excellent implementation and customer service. From the beginning, Voalte partnered with Apple to use iPhones and to incorporate Apple’s proven approach for quality smartphone user interfaces. Their physician app is a recent addition and is not as full featured the nursing app. Voalte’s ability to overlay a large health system with a large number of hospitals is limited, and the ability to communicate outside the enterprise with health care trading partners (for use cases like discharge coordination) is also limited. Voalte is a pure play messaging vendor. Voalte added voice to their text based conversational user interface. Like many of their competitors, they have relied on partners for medical device alarm notification (mostly ConnexAll), on-call scheduling data (Lightning Bolt) and other common functions that impact messaging. Much of Voalte’s solution is based on the open source Open Telcom Platform developed by Ericsson and written in Erlang. Like some of their competitors, Voalte has focused on communications and does not include a rules engine for workflow automation or middleware for integration of medical devices and other systems. A story from Zachs Equity Research, a month later on August of 2018, describes Hill-Rom management’s intent for Linq consistent with the above statement. Interestingly, Zachs also notes, "Per management, this move will pave the way for an additional market opportunity of around $200 million." Linq was officially released on January 7, 2019 (press release). The press release for the Voalte acquisition, a little more than 2 months later, states, "Part of our strategy was to expand into the digital mobile health care space and Voalte is a major player in this space," said Howard Karesh, Hill-Rom's vice president of corporate communications. This acquisition appears to be consistent with the objectives stated for Linq, including a growth play (to the tune of $200 million). Hill-Rom’s NaviCare nurse call has between 750 and 800 sites, while Voalte has around 200. The NaviCare installed base represents a big opportunity for Voalte sales. With Voalte, Hill-Rom has arguably acquired the market leader. A key question is whether Voalte is a replacement for Linq or whether there are parts of Linq that can be efficiently integrated with Voalte to create a product that is better than Linq and Voalte on their own. And if there is an integration opportunity on a functional level, the next question is whether the two product’s technology make tight integration practical. 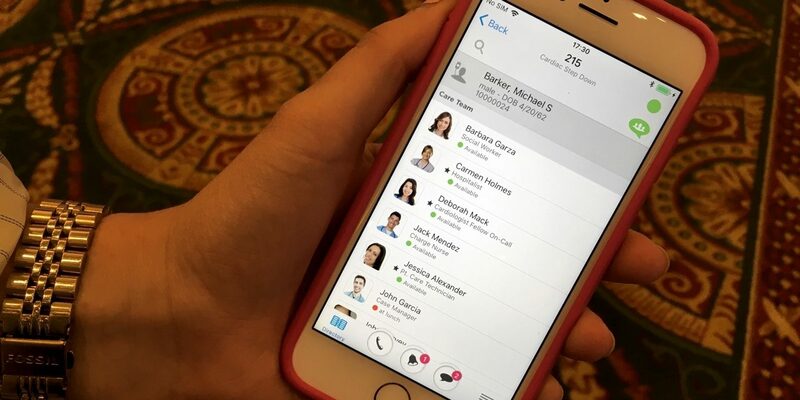 Will Hill-Rom pursue Ascom’s strategy of merging their nurse call with their messaging system? Or will Voalte remain a separate but integrated product versus fully merged with NaviCare. Will this make it more difficult to see Voalte outside of Hill-Rom’s customer base? Solutions like medical device data systems (MDDS) and health care messaging and orchestration systems often serve as neutral players in the market that integrates with many different medical device, EMR and other health care IT vendors. When one of these companies is acquired by a competitor in the market, like Philips did with Emergin, the acquired vendor can no longer claim the neutral ground it once claimed. This can cause past integration partners and alliances to pull back from the acquired company. The acquiring company can also be tempted to withhold collaboration with competitors or even other third parties when in competitive situations. A big part of Voalte’s success has been their flamboyant marketing, from the hot pink scrub suits to social media and viral videos. Voalte has really stood out in the market with their unconventional twist on going to market. Arguably, a good part of Voalte’s value is their branding. This alignment of company cultures also extends into another Voalte strength, their customer facing areas like sales, installation/implementation and support. This area will have a bigger impact on the success of a Voalte acquisition than retaining the Voalte branding. Hill-Rom’s branding is different but very strong in the market. However, as Voalte’s service and support is brought into alignment with Hill-Rom’s, any perceived reductions in service levels could cost Hill-Rom some Voalte installations. In a perfect world, the acquiring company takes the best characteristics of the acquired firm and adopts them into their own operations. Probably the biggest risk with acquisitions or mergers is the not invented here mindset that can exist among product development organizations. This would seem a major risk given that Hill-Rom already has their own messaging solution, Linq. Human nature being what it is, the innovation represented by an acquisition is often crushed by the culture of the acquiring company. Hopefully, Hill-Rom management will successfully navigate this transition in such a way as to preserve Voalte’s value and strengths and incorporate them into Hill-Rom. Should Hill-Rom successfully sell Voalte into a meaningful percentage of their NaviCare sites, Voalte’s sales volume could increase post acquisition. Alternatively. when Voalte is pulled back to mostly or only supporting Hill-Rom products, the scope of Voalte’s addressable market will be reduced considerably. Should sales decline, Voalte’s current burn rate, maintained to grow the business in the broader market will no longer be justified. A rather substantial reduction of budgets and headcount will occur, probably gradually over time. Voalte and Hill-Rom competitors are surely sharpening their knives, creating short term plans to take advantage of this news to gain competitive advantage over Voalte. Any Voalte customer or prospect that’s not a Hill-Rom customer will likely be targeted. The success of these short term plans, and the effectiveness of Hill-Rom/Voalte’s response could impact Hill-Rom’s post acquisition plans. Just the uncertainty of the acquisition could result in some degree of lost sales and/or customers. The next 12 to 18 months will likely tell the tale of this acquisition, whether it was a success or not, and to what degree. A compelling product roadmap leveraging Voalte in a timely fashion, along with sales demonstrating the synergy of a strong messaging solution with Hill-Rom’s products will indicate a big success. A lack of apparent synergy with Voalte, lost sales and lost customers will bode poorly for the long term success of the acquisition. With every acquisition there are certain company employees who chose not to stay. Senior management will be expected to move on sooner or later, but more than a trickle of key managers and technical contributors leaving is a bad sign. This will be another important indicator of the success of this acquisition. Messaging market consolidation may be heating up. There are more than 200 vendors in the broader health care messaging market and about 100 in clinical communications and collaboration. Many of these vendors are likely running out of runway and seeking an exit — especially those that have not raised a round in 2 or more years (unless they’re cashflow neutral or positive). How many of those 200 vendors closed their doors but left their website active is unknown at this point. Certainly there are some software assets that could be acquired for pennies on the dollar. Even market leading vendors can be cash flow negative or requiring more capital to fund growth. Of the above acquisitions, arguably the most successful is USA Mobility’s acquisition of Amcom. Amcom was a telcom oriented rollup with a health care focus and a messaging component (CommtechWireless) that fit well with USA Mobility’s telcom roots. Amcom’s health care business has come to be the major offset to the slowly fading pager business for Spok. Almost anyone who’s not yet been acquired is a target. Off the table for now are companies that are already acquired. The market leaders need capital to grow and many independent vendors are running a deficit funded by debt or equity. Those that are not (yet) market leaders need to fund continued development and go-to-market expenses. Just this week, messaging startup Klara announced a Series B funding round. There are still lots of interesting startups in the broader messaging and orchestration market. Current market leaders should not get too complacent. UPDATE: The acquisition date of Amcom by USA Mobility was corrected. Great analysis, Tim! Thanks for writing this up and covering all the angles: technical, competition, funding, branding, corporate culture and overall market.